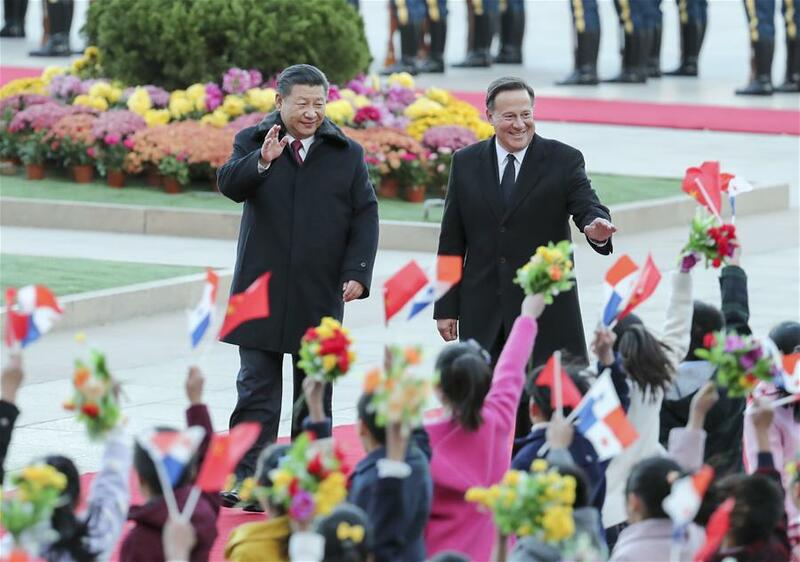 BEIJING, Nov. 17 (Xinhua) -- Less than half a year after the two countries forged diplomatic ties, Panamanian President Juan Carlos Varela embarked on his state visit to Beijing, showing his strong will to deepen cooperation with China. Varela's first event in Beijing was to inaugurate the Panamanian Embassy on Thursday, which was of great symbolic significance. The visit came just weeks after Chinese President Xi Jinping's re-election as general secretary of the Communist Party of China (CPC) Central Committee for a second term at the first plenary session of the 19th CPC Central Committee on Oct. 25. Varela's formal talks with President Xi on Friday and a joint statement issued afterwards gave new orientation to the China-Panama relationship. According to the joint statement, China and Panama are committed to building a model for friendly cooperation between countries with different scales and national conditions. During the historic visit, China and Panama announced the launch of a joint feasibility study on the China-Panama free trade agreement. The two sides also decided to sign an inter-governmental agreement on maritime transport. With the cooperation potential gradually explored by the two sides, more progress showed that the outlook of China-Panama cooperation and exchanges are promising and set to boom. The two sides have opened their respective embassies in each other's countries, enterprises inked 14 trade agreements with a combined contract amount reaching 38.7 million U.S. dollars in September, and a Confucius Institute has been inaugurated in Panama city. These early results proved that Panama's choice to sever ties with Taiwan and adopt the one-China policy was a wise and welcome one, and meets the fundamental, long-term interests of both countries. Through top-level contact, which guides the direction of the development of the bilateral relationship, China and Panama have laid a solid political foundation and built a framework for long-term cooperation. In the joint statement, China and Panama agreed that adhering to the one-China principle is a broad consensus of the international community and a fundamental precondition and political foundation for the establishment and further development of the China-Panama relationship. Pledging concrete steps to advance construction of a new type international relations featuring mutual respect, fairness, justice and win-win cooperation, the two sides agreed to share the fruits of cooperation and make the achievements benefit the two peoples. China is a major trader and the world's second-largest economy, and Panama is an important regional logistics hub. Such complementary strengths herald a bright future of fruitful cooperation. In 2016, bilateral trade hit 6.38 billion U.S. dollars while China's direct investment in the Central American country exceeded 230 million dollars. By aligning the Belt and Road Initiative with the country's development plan, Panama 2030, the two sides will see new opportunities to develop bilateral ties. The strong lineup of Varela's delegation also demonstrates Panama's keen interest in forging closer economic ties with China. The delegation reportedly consists of Panama's entrepreneurs and senior officials from sectors such as finance, commerce and industry, canal affairs, public security and tourism. After the talks, Xi and Varela witnessed the signing of a slew of cooperative documents, covering areas such as economy and trade, investment, finance, tourism, shipping and civil aviation. Moreover, China and Panama also voiced consensus on some regional and global issues. Both sides uphold democratization of international relations and agree on joint efforts to promote the construction of an open world economy. According to the joint statement, China appreciates Panama's constructive role in international and regional affairs, while Panama will take an active part in the construction of China-Community of Latin American and Caribbean States (CELAC) Forum, and promote overall cooperation between China and Latin America. Now all the energy accumulated over the years is going to unleash, promoting highly efficient economic and trade cooperation between the two countries. As the China-Panama relationship stands at a new starting point, with concerted efforts of both sides, the two countries will achieve more progress that accord with peoples' desire and historic trends.